Russia has dramatically increased its gold production and may yet beat the U.S. to the third place in the output of the metal this year. Moscow is planning to sustain this growth by making it easier for foreign companies to obtain geological survey permissions. Having just recently replaced South Africa as the fourth largest gold producer in the world, Russia now stands a good chance of ending up in third place this year. The country produced slightly less than 156 tons of gold in the first eight months of 2013, or 15.1 percent year-on-year increase, the Russian Union of Gold Producers (UGP) reports. Gold mining grew by 8.8 percent; byproduct production, by 4.2 percent; scrap production, by 192.7 percent, thanks to a ramp-up in production capacities at Moscow Special Alloys Processing plant and at the Krasnoyarsk-based Krastsvetmet facility. Production of gold concentrates rose by 132 percent year-on-year in the first six months of 2013. This positive dynamic is explained by Russian gold producers' attempts to make up for a drop in revenues that was caused by the recent decrease in world gold prices. "In order to maintain the requisite monetary flows and to be able to repay bank loans on time, gold producers have started to mine more gold," says UGP Chairman Sergey Kashuba. The value of gold has decreased by 19 percent since January, and the outlook is for this trend to continue, making 2013 the first year of cheaper gold after a decade of constantly growing prices. "The upward trend has certainly been broken in 2013; next year I expect gold to approach the price of $1500 [per ounce]," says Oleg Dushin, senior analyst at the investment company Zerich Capital Management. Analyst Dmitry Tremasov at BKS Forex concurs: "There are very few growth drivers, so the price of gold is not likely to resume growth in the foreseeable future. From an instrument of protection, gold has turned into a risk asset dependent on fluctuations in the dollar exchange rate and also on the monetary policies of the U.S. and other countries." 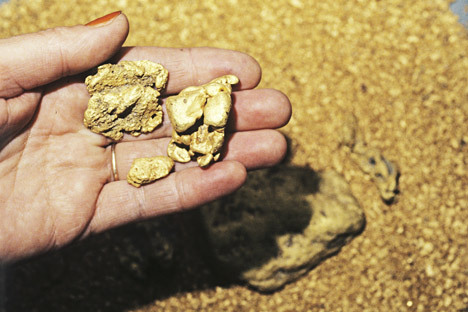 Gold extraction and production has been growing in Russia since 2008. The UGP expects production to reach 234 tons in 2013, making Russia a realistic contender for third place worldwide. The closest competitor is the U.S., which came third in 2012 with 235 tons. This year, however, the U.S. has slowed down the output of gold (-3 percent year-on-year for January through June, according to U.S. Geological Survey). The first two positions on the list are historically held by China and Australia, and this year will not be different in this respect. On the other hand, there are limits to how fast the Russian gold industry can grow. The current growth is explained by accelerated consumption of the country's mineral resources and may stop if the gold prices remain low for several years. According to the Russian Ministry of Natural Resources, the country's on-balance gold reserves stand at 12,500 tons (more than 11 percent of the global reserves). Only South Africa has more. The Russian government is currently developing measures to expand these reserves. In particular, the Ministry of Natural Resources is working to relax the geological survey regulations. If the initiative is approved, the first company to apply for developing a deposit will be issued with the corresponding license. This, however, will only concern underexplored deposits whose reserves have not been established yet. Gold producers would benefit most from such a scenario. At present, the Russian government maintains restrictions on the size of reserves contained in deposits; the limit for gold is 50 tons. Any reserves greater than that are listed as federal property and their development must be approved by the government. The project is expected to be initially launched in Amur and Sverdlovsk regions, and also in the Maritime and Khabarovsk territories. "The initiative itself will not result in a stampede of investors into Russia's geological survey sector," says Peter Kaznacheev, senior lecturer in energy studies and development economics at the Institute of Business Studies at the Russian Academy of the National Economy of the Russian Government (RANEPA). "It will, however, indicate to potential investors that the government is prepared to change the rules of the game to a certain degree." Kaznacheev believes the phase of nationalization in the raw materials sector is over in Russia, and that the government has come to appreciate the benefits of cooperation with international companies. The next logical step, he says, could be the adoption of the initiatives proposed by the Ministry of Natural Resources in summer 2013. These include giving foreign companies preliminary guarantees for development of federally controlled deposits and raising the federal-asset threshold for gold deposits from 50 to 250 tons. "This would be a step toward tearing down the existing bureaucratic obstacles," says FCG partner Alexander Minkin. "Relaxing the requirements for access to Russian subsoils would potentially benefit producers, but the possible success of this move is difficult to predict." Another measure aimed at sustaining the growth in Russian gold production was the launch of trade in ETF physical gold at Moscow Exchange in mid-October. Shares will be initially made available to resident companies, government organizations, and banking institutions of the Eurasian Economic Community member nations. Foreign businesses may take part as clients of resident companies. "Simultaneously with the ETF, the exchange launched gold spot trading," says Zerich's Dushin. "These measures should revive the interest of citizens and banks in gold transactions, as evidenced by the active trade in gold futures at Moscow Exchange."